DD Form 4797-1 - also known as the "International Standardization Agreement Review Data Sheet" - is a Military form issued and used by the United States Department of Defense. The form - often incorrectly referred to as the DA form 4797-1 - was last revised on January 1, 2004. 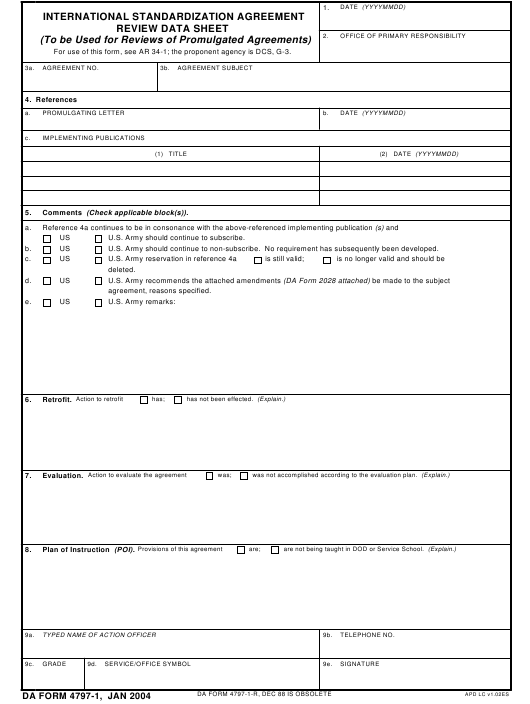 Download an up-to-date fillable DD Form 4797-1 down below in PDF-format or find it on the Department of Defense documentation website. U.S. Army should continue to subscribe. U.S. Army should continue to non-subscribe. No requirement has subsequently been developed.